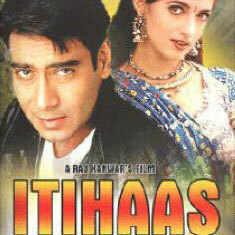 "Itihaas" is a 1997 hindi film which has Ajay Devgn, Twinkle Khanna, Sapna Bedi, Shakti Kapoor, Amrish Puri, Raj Babbar, Kanchan, Neelima Azim, Brahmachari, Arun Bakshi, Aruna Irani, Mohnish Bahl and Surendra Rajan in lead roles. We have one song lyrics and one video song of Itihaas. Dilip Sen-Sameer Sen has composed its music. Hariharan and Alka Yagnik have sung these songs while Sameer has penned its lyrics.